A few months ago I worked very hard to get rid of the clutter on my counter tops. This involved de-cluttering the cabinets underneath, specifically de-cluttering the cabinet lazy susan which was on Billiam’s List, and was an all day process. As I surveyed the lovely results of my labor, my gaze ground to halt at the site of all the technocrap and cords that really could not go elsewhere. For several weeks this was a source of much grumbling every time I looked at it. With the Craig’s List finds, I did something about it. The technomess has been contained! This was my technomess. 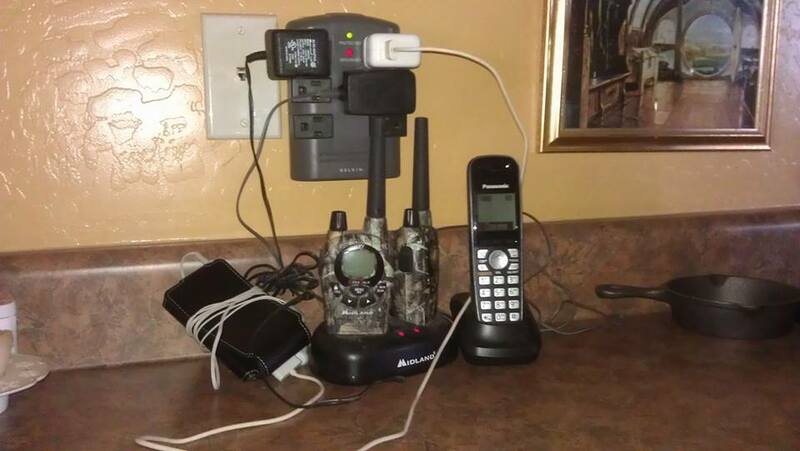 Phone, weather radios, iPod, and the giant multi-plug. First I measured the space I would need to neatly and snugly corral the technology. I’d found a truck load of used and leftover lumber pieces and cabinet doors on Craig’s List just for such projects. I used 1 X 3 pine boards for the frame and shelf insert. The outer frame is connected with 1 inch stainless steel corner braces. The inner shelf is supported by trimmed scraps from the 1 X 3 inch boards which are glued in place with wood glue prior to painting the shelf. Because the shelf is not there to support anything heftier than an iPad and cell phone, I didn’t bother with wood screws. The glue is fine for this purpose. Once the glue was dry, I painted the entire unit. 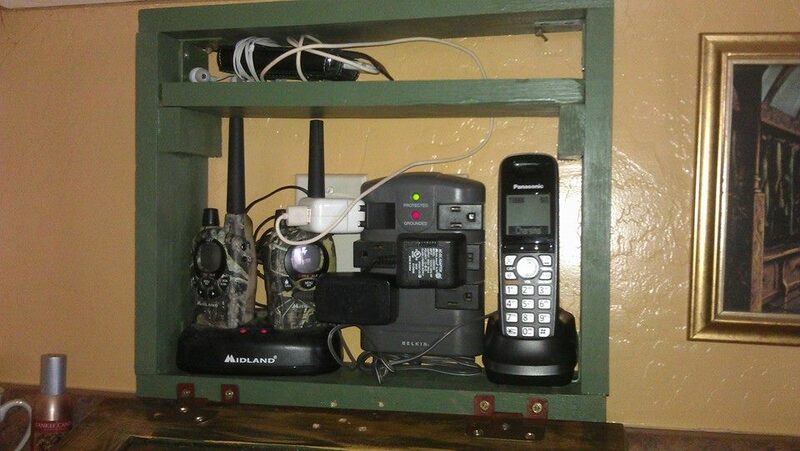 Not only did the shelving have to fit the technology I was trying to hide, it also had to fit one of the used cabinet doors I found on Craig’s List. I built it so that there is a slight lip on the sides and top for easy raising and lowering without hardware. The fellow I bought the used cabinet doors from, threw a 5 gallon paint bucket of hinges into the bargain. I’ll not need to buy hinges in the foreseeable future. Because the cabinet door had been poorly stained and fairly abused, it required sanding. 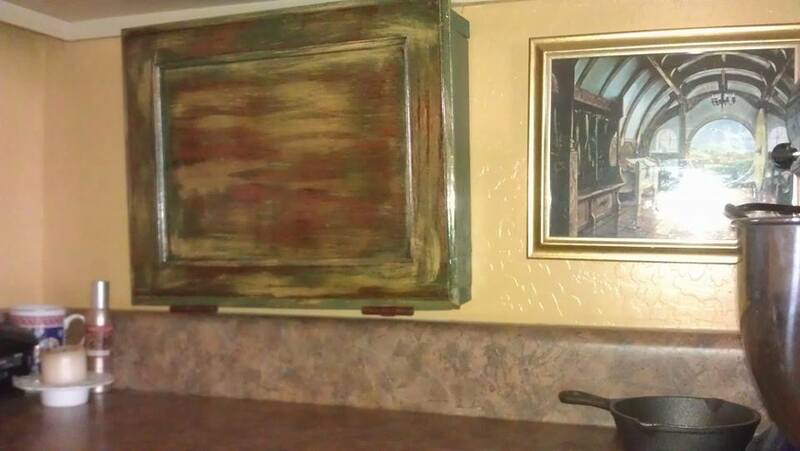 I then covered it with a thin coat of the same Apple Butter paint color that is on the kitchen walls and let it dry. Next I painted on a thin layer of the green that I’d used on the shelving and let that dry. Once the paint was dry I sanded it so that some of the wood, some of the yellow and some of the green showed. After wiping off the dust from sanding, I brushed a coat of Minwax Espresso stain over the entire door and let it soak in for about 10 minutes before wiping it off. This process of paint, rough sanding and stain is what gives the finished piece the weathered and aged look I am fond of, but you can easily just use a gloss paint or a polystain for whatever look you like. You could also use a nice wooden picture frame that you can attach small hinges to for the door and use a nice photo or painting to cover the clutter within. Once the finish had dried, I coated it with polyurethane so that it’s easy to wipe down with a damp rag. I do use that kitchen and I wanted to be able to clean mixer spatter off of that cabinet. I added the hinges on the bottom so that I can easily swing the door down to access the phone, radios and plug my mixer into the gigantoplug. TaDA! Technomess containment has been achieved. They often have cabinets and cabinet doors at the Habitat Restore in Wickenburg. Habitat Restores are great places Jean! The one in Surprise had a large collection of cabinet doors last time I was there. I still have a ton of them from that Craig’s List. Restores often have door hardware too. I’ve gotten some inexpensive door handles there to make serving trays.